Think doors are boring? Think again! If you’re undertaking a rear, side, or wraparound extension, doors can transform your entire household. Far more than just a simple gateway to the outside, the options on offer allow you to bring more light into your home, as well as creating a real WOW factor for future buyers. Starting with the most traditional option, french doors bring a classic touch to any home. French doors are mainly categorised by opening on a hinge, rather than a sliding mechanism like patio doors. This gives a traditionalist touch, which can enhance the charm of period properties, or add character to new builds. If you’re looking for more natural light into your home, but want to avoid extensive panes of glass for privacy reasons, then french doors would make an excellent choice. Sliding doors have been a popular feature in homes for over 50 years, and it’s not hard to see why. Capable of being fully glazed, and covering large areas of the rear, they can provide stunning views, plus floods of natural light into your home. What’s more, unlike French doors that open into your household, and bi-fold doors that need space to fold, they’re the most space efficient option. You can even design what is known as a ‘pocket door’, whereby your doors can slide open into cavities within the wall. Perfect if you’ve got a smaller space to play with! 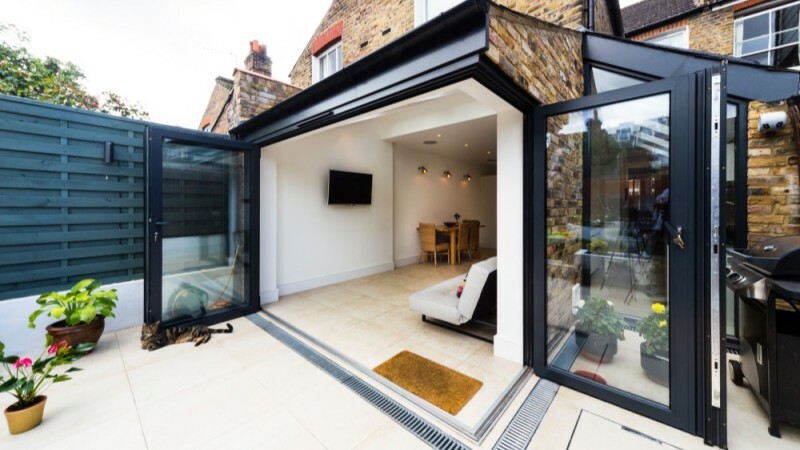 Bi-fold doors are seeing a surge in popularity in recent years, as more and more homeowners turn to these doors to become the focal point of their new extensions. Unsurprisingly, they get their name from the way in which the sections fold into each other, creating a concertina effect with glass panes. They’ve become a hit in the UK because they allow an entire wall to be made up of glass, and then opened. Helping to merge both the inside and outside space during hot summer days. They can even be used in conjunction with floating corners, allowing homes to open in a 180 manner. However, the downside to them is not only the expense, but also the space they take up when opened. Making them an unlikely candidate for homes with small gardens or modest budgets. Crittal - These steel-framed windows were created in 1860 by an ironmonger in Essex called… you guessed it, Francis Henry Crittall. They’ve had a resurgence of popularity for their ability to create stylish glass structures, that perfectly blends the metalwork and glazed aesthetic currently on trend. Repetition - Want french doors but also want the light benefits from both bi-fold and sliding? It might be worth considering multiple french doors, if you’ve got the space. This repetition creates a charming look, while also bringing in plenty of natural light. Timber - If a more rustic look is your thing, you might consider constructing your new doors out of a more natural material. Wooden doors do need more treatment and care than their metal counterparts, but they’re also much easier to repair. Even bi-fold doors can be crafted from our tree friends.